Spin caloritronics is a new emerging field that explores how heat currents transport electron spin. One interesting application in this field is the use of waste heat to create spintronics devices that do not require any external power to operate. The thermally driven transport application of spin caloritronics is based on the Seebeck effect - which takes use of the temperature difference between a ferromagnet (FM) and a nonmagnetic metal (NM) to create a thermoelectric voltage. 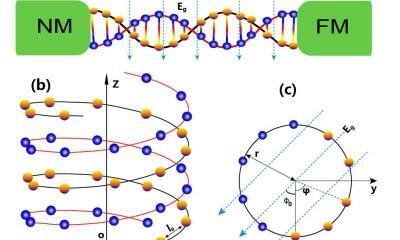 In a new research done at the China University of Mining and Technology (CUMT) have theoretically exposed the fundamental aspects of this thermal transport along double-stranded DNA (dsDNA) molecules. The research may pave the way of creating functional thermoelectric devices based on dsDNA and other organic molecules.